This type is an improvement on the basic Manual Top Discharge Centrifuge. 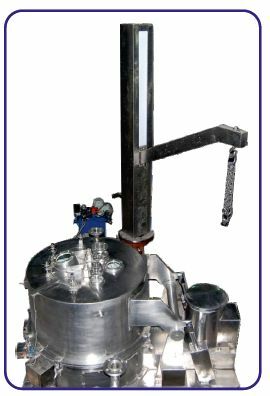 The machine has a dynamically balanced rotating basket with a conical shell for easy removal of filter bag with solid material. Our compact spring assisted lifting mechanism enables opening of lid by a single person. Alternatively, Hydraulic or Pneumatic arrangement can also provided. Crystal structure intact since no attrition. Useful for hard, slimy, crystalline and amorphous cake. Easy cleaning and maintenance due to fully opening outer body lid. the machine to start unless all basket locks are properly engaged.